SKU: PL14112. Categories: Nautical, Sports & Recreation, Sailing. Tags: bluewater cruiser, boat, boating, paradise, seamanship. Including stories from paradise and hard-won lessons in seamanship,Taleisin’s Tales reflects back to the first miles Lin and Larry Pardey gained together on their second boat one they built lovingly with teak carvel planking over sawn black locust frames. The book begins with the boat launch and the transition from their cherished Seraffyn, and includes details from outfitting, provisioning and final detailing during the early months Lin and Larry spent getting to know their new bluewater cruiser, as well as moments of melancholy as they let go of attachments to their first trusty boat that took them around the world. Taleisin’s Tales takes the reader through those initial cautious 1000 coastal miles between California and the Sea of Cortez, discussing everything from sail handling to dinghy racing to the relative luxuries of bicycles and a custom-built sitztub. It reveals surprising and pleasant engagements with other sailors and locals along the Baja peninsula. Then it launches the reader across the Pacific, sailing with the Pardeys on Taleisin s first offshore leg to French Polynesia, through the Cook Islands and Tonga, then on to New Zealand, where they eventually made their new home. In the style readers have come to know through the Pardeys’ ever popular Cruising in Seraffyn series and Lin’s award winning Bull Canyon, this book relates stories sometimes harrowing, sometimes cautionary, sometimes hilarious and often heart-warming, especially when it comes to encounters with the people of the South Pacific who become family. If there is a lesson to be gained from reading Taleisin’s Tales, it’s that slowing the pace and taking each day as it comes brings unexpected moments of clarity and joy. And that sailing across an ocean on a small boat is not easy but, with the right partner and attitude, can be beautifully rewarding. 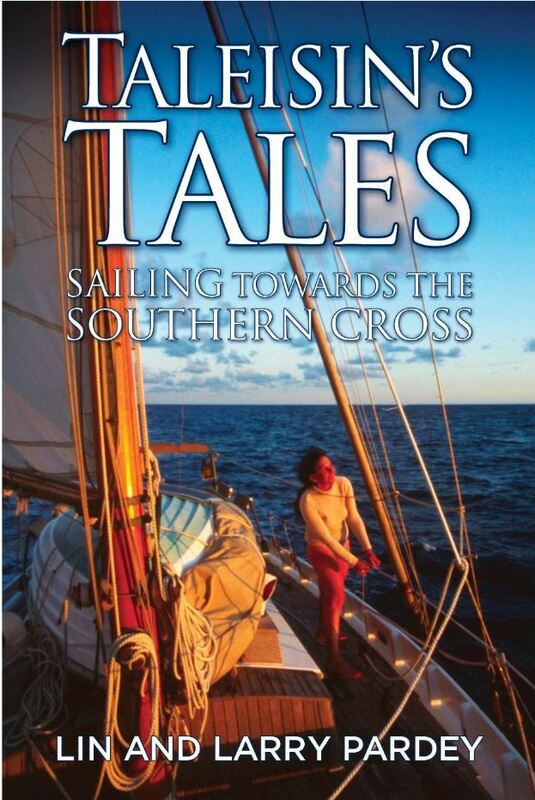 Taleisin’s Tales takes the reader from Bull Canyon, California, to Kawau Island, New Zealand, where, after 28 years of voyaging on Taleisin, Lin and Larry now spend their time running a small nautical publishing company and managing a very small boatyard, puttering about on their fifteen-foot Herreshoff sloop and reflecting on their five decades of bluewater cruising. Lin, with her husband Larry is world renowned for her sailing exploits. Author of eleven best selling books on sailing and seamanship, several hundred articles which have been translated into five different languages, she has been keynote speaker in at the Pacific Northwest center of the Sea, the University of Houston Woman’s Forum and Egyptian commission on future tourism.Her previous book, Bull Canyon, a memoir published in 2013 received three literary awards.